Fraser Lake Part of the BC Adventure Network. Over a million web site visitors annually ! Set along the shores of Fraser Lake and a fly rod's cast from hundreds of other lakes, is the village of Fraser Lake. Molybdenum mining and logging keep people employed here, and the incredible fishing attracts even more. Rainbow Trout and Lake Trout lure the summer fisher while winter with prime fishing for Ling Cod and Lake Char is also enticing. Although there are many good fly fishing areas, the Stellako River to the south attracts fly fishers from around the globe. There are lakes in every direction which have lodges and resorts popular, not only for fishing, but for family vacations. Canoeists enjoy the many rivers while hikers, sightseers and mountain bikers can enjoy the many backwoods trails. There are also ancient volcanic ruins in the area which are interesting to explore. Beaumont Provincial Park, to the east of Fraser Lake, is not only a prime recreation and camping area, but is built on the site of an 1800's fur trading post. For the visitor who enjoys the outdoors, Fraser Lake can act as access to an adventure in outdoor recreation. 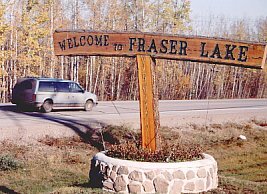 Access: Located on the main Yellowhead Highway (Hwy 16), Fraser Lake is easily accessed by car, bus or rail. Accommodations: There are a number of private and provincial campsites in the area with many lodges and resorts on the surrounding lakes. Burns Lake has a variety of hotels and motels.